Schiebel received a contract from the Italian Navy in February 2014 to provide a Camcopter S-100 UAS. Image courtesy of MatthiasKabel. The Camcopter S-100 UAS has automatic vertical take-off and landing (VTOL) capability. Image courtesy of Stahlkocher. The Camcopter S-100 UAS has a maximum air speed of 130kts. Image courtesy of MilborneOne. The Camcopter S-100 UAS was displayed at ILA Berlin Air Show in June 2010. Image courtesy of Bin im Garten. Camcopter S-100 is an unmanned air system (UAS) designed and developed by Schiebel, a company based in Austria. The unmanned system can be deployed for a variety of missions including border and territorial water patrol, reconnaissance, search-and-rescue, countermeasures, anti-smuggling, route surveillance, convoy protection, psychological operations, damage assessment, task forces, pollution and oil spill monitoring, minefield mapping, and other command-and-control operations. Tanan 300 is a new generation vertical take-off and landing (VTOL) tactical unmanned aerial system (UAS) being built by Cassidian, an EADS company (now Airbus Defence and Space). The Camcopter S-100 UAS is controlled by a Ground Control Station (GCS) equipped with two laptop computers, an intelligent interface, control screen and a control station. The GCS is used for mission planning, processing, retrieving and storing the information provided by the unmanned system. Schiebel was awarded a contract by the US Army to deliver a Camcopter S-100 for the humanitarian demining operations in March 1997. The UAS successfully demonstrated its naval and coast guard capabilities from the US Coast Guard Cutter, Valiant for the Joint Interagency Task Force (JIATF) East in August 2000. 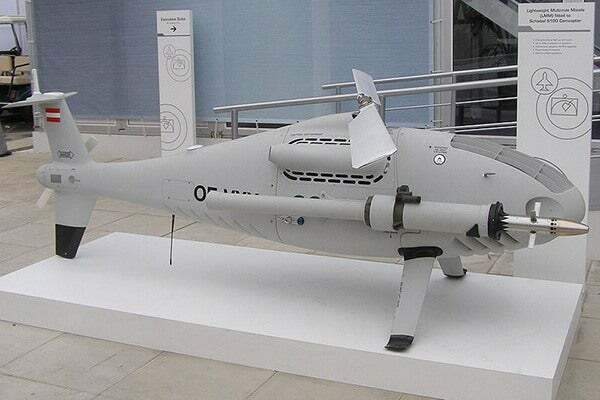 The Egyptian Navy received a Camcopter S-100 UAS in 2002. The UAS performed a two-week border patrol exercise for the Austrian Ministry of Interior (Bundesministerium für Inneres – BM.I) in September 2006. In December 2009, the French Direction Générale de l Armement (DGA) signed a contract with Schiebel to lease Camcopter S-100 UAS for the assistance of both land and coastal operations. A total of four trials were completed by August 2010. In July 2010. Schiebel was awarded a contract by the King Abdullah Design and Development Bureau (KADDB) of Jordan for two Camcopter S-100 systems to assist the Jordan armed forces and the Royal Jordanian Air Force. The deliveries were concluded in February 2011. "The UAS has a maximum air speed of 130kts and a typical cruise speed of 100kts." French shipbuilder DCNS partnered with Schiebel in June 2011 for the integration of Camcopter S-100 with the French Navy’s Gowind class offshore patrol vessel, L’Adroit. The UAS was delivered to the French Navy in October 2011.